Modeling computers after our brains sounds exciting...for the entire spectrum of reasons. Even after all the developments in computers, the human brain remains by far, the most complex, sophisticated, and powerful computer in existence. And for decades, scientists have been looking for ways to translate its processing mechanisms into a system that machines can replicate. IBM is one of the most avid proponents of cognitive computing, with their artificial intelligence program, Watson, being the first cognitive system ever created. In 2011, Watson debuted on the television show, Jeopardy!. Despite not being connected to the internet, Watson won the quiz show against two human opponents, taking home a $1-million prize. “Cognitive computing refers to systems that learn at scale, reason with purpose and interact with humans naturally. Rather than being explicitly programmed, they learn and reason from their interactions with us and from their experiences with their environment,” IBM wrote in their whitepaper. Last year, IBM pulled off a 48-million connection network—around the same computing power as a rat’s brain, with their system TrueNorth. 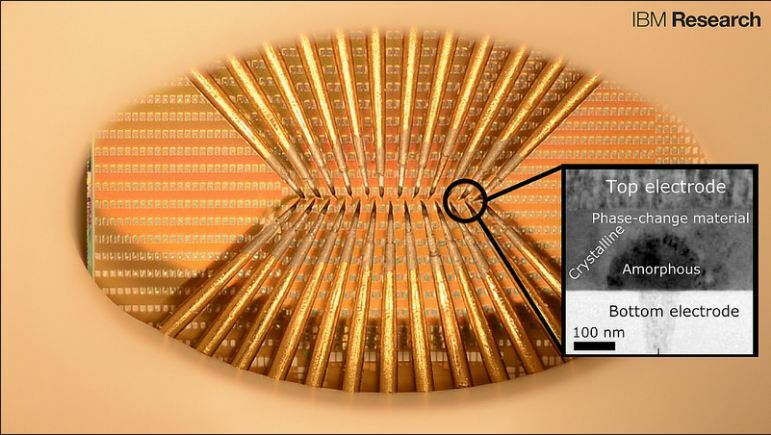 Earlier this year, they were able to fit 3 bits per cell in phase change memory (PCM). Now, they are taking another big step forward in the quest to recreate the human brain’s cognitive computing power. IBM scientists in Zurich designed artificial neurons using phase-change materials, including germanium antimony telluride. These materials exhibit two states, amorphous and crystalline, and are the same materials that made optical disk storage possible. These phase-change-based artificial neurons can perform complex computations and fast learning while using very little energy, much like the human brain. The artificial neurons effectively fired in response to electrical pulses that made it crystallize, a property known in neuroscience as integrate-and-fire. This is the property which allows animals to react accordingly to stimuli, such as when you touch a hot surface. These artificial neurons survived being subjected to billions of switching cycles, which would translate to multiple years of operation at an update frequency of 100Hz. Each neuron update required less than five picojoules and the average power less than 120 microwatts. “This will significantly reduce the area and power consumption as it will be using tiny nanoscale devices that act as neurons,” says IBM scientist and author Abu Sebastian. “Populations of stochastic phase-change neurons, combined with other nanoscale computational elements such as artificial synapses, could be a key enabler for the creation of a new generation of extremely dense neuromorphic computing systems,” adds research co-author Tomas Tuma.